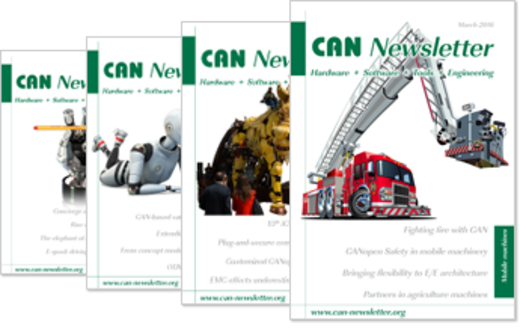 Since June 1992, the CAN Newsletter has been published. It is a unique source for engineers designing CAN products and CAN systems. Published quarterly, it contained product and technology oriented articles as well as application stories. There were news and reports written by the editors as well as technical in-depth articles by external authors. Since March 2012, the news and reports are outsourced to the CAN Newsletter Online. In future the PDF-version of the CAN Newsletter will contain mainly technical articles and detailed application reports with a longer “expiration date”. The CAN Newsletter magazine is published quarterly as pdf. Of course, the professionally edited publications need to be financed. If you want to advertise your products and services, there are several opportunities such as classical advertisements in the the CAN Newsletter, which are combined with a banner ad in the CAN Newsletter Online publication for a period of time (e.g. three months). Other options are the sponsored links: The topic-related links are temporarily bookable, while the article-related ones are permanent links. The entries in the CiA Product Guides are also time-limited (one year). Links to your product or service entry appear automatically as sponsored links in the related “frame” of the CAN Newsletter Online. Keep in mind that most of these advertisement opportunities improve mainly the image of your company. Don’t count just clicks or leads. CAN is not a short-term business as cellular phones, it is an investment business, where your company’s long-term image counts. With your advertisement you are part of the community, and your business increases substantially. Don’t live from hand to mouth. By the way, advertisement rates are very reasonable.